Happy 2016! Greg started off the show talking about the redesign of Cazillo.com, what do you think? 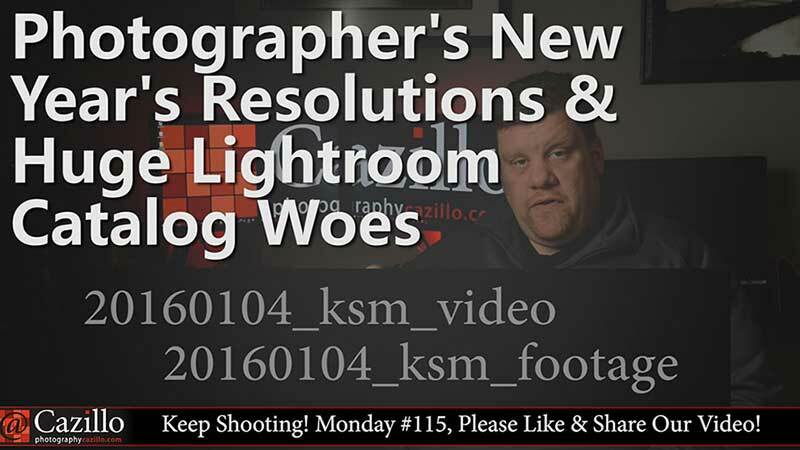 Next up was some New Year's Resolutions for Photographers. One of our big priorities should be making sure our photo archive is in good shape and organized. Once its organized, it needs to be backed up on a regular basis. Greg then discussed some issues he has with over 185,000 photos in his very large Adobe Lightroom catalog and how slow it is after combining all of his smaller catalogs. In the news Greg talked about a new 100MP digital back from Phase One, a simple way to safeguard your camera gear in your car, and printable set of sheets giving you shortcuts for 7 popular Adobe apps. Finally Greg answered a couple of #Cazillion questions about contract disputes and how to properly frame a photograph, making sure never to put the photo right against the glass. Keep shooting!